Almost 100 years ago, "starving Armenians" became a familiar phrase used in American homes across the country. The term was used in two contexts, first being used to refer to survivors of the Armenian Genocide. Later, it came to represent hunger. "At four o'clock, we tore home like starving Armenians," a Pennsylvania paper wrote in 1935. "Into the kitchen pantry we raced." What Americans didn't know was that despite the demeaning stereotype, Armenians had a rich, ancient food tradition. And along with the survivors who came to the U.S. as some of the country's first, official refugees, these traditions came with them. Perhaps the most enduring and symbolic of food traditions centers around a sweet bread called "choreg" made during Easter, which emits a fragrance while baking that is so potent, so intoxicating, it is permanently embedded in the olfactory memories of the adults who once grew up with it. For many, choreg is an all out obsession, inhaled in copious amounts at the first opportunity. No matter how much you eat, it never seems to be enough. No matter how much time has passed since you've eaten it, you will never forget the taste. Can this yeast-laden bread whose iconic ingredient involves a powder made from the seed of a sour cherry carry this much weight, unequivocally defining who you are? For the descendants of survivors who settled in cities like Boston, Detroit, Racine, Chicago, Fresno and Philadelphia and so many other pockets in the U.S., choreg is the cornerstone of their identity, made generation after generation during Easter in the houses they grew up in, intertwined with the most significant childhood memories they had. "This beautiful, sweet choreg with the little sesame seeds on top would come out of the kitchen and make us crazy." This is how Sonya Avakian remembers the bread that bound her family together, even when things got difficult. When Avakian, who was born and raised in Detroit, was really young, her mother fell ill and ended up in the hospital one Easter. "Who is going to make the choreg?" her dad asked. "You are," her mom replied. In their 900 square foot house, Avakian's dad became the choreg king from that point forward, ushering everyone out of the kitchen before he methodically got to work. "He would put the [cook] book in the middle of the table, he would put the ingredients on one side and measuring cups on the other, it would look like a surgical plan," she says. "He didn't want to hear from us." It is a spiritual experience all on its own and as Avakian says, it was the one thing in the old country that when they had nothing, they could still put choreg together. "That was the life force," she says. Jesus always rises, but if you're lucky, so does the choreg. Life force indeed. Spelled "choreg," "chorek," "cheoreg" or "choereg," it is, like so many other items, a shared food tradition among many communities, including Armenians and Greeks, often braided using three ropes which are said to represent the Holy Trinity. Its ingredients are simple - flour, butter, yeast, sugar, eggs, milk and a good pinch of mahlab, - but making choreg is a long, drawn out procedure requiring lots of love and care. Making choreg means following the first rule of Armenian cooking: do not be afraid of the dough, especially dough that demands a lot from you like choreg does. It demands your energy and your soul. You have to muster up the strength to knead it and make it bend to your will, but you also have to muster up the strength to have your essence intertwine with the yeast, because whoever eats what you've made, will never forget you. It is a ritual, a meditative process that takes hours, and it has the kind of gravity that pulls in people from everywhere, like Ani Tascian's Argentinian mother who continues to make it to this day. Tascian, a Bay area native and writer, grew up with Armenian food thanks to her mother's openness to absorb the culture. "She came to the U.S., but assimilated into the Armenian community, which I think is rare," says Tascian. Along with all of her father's family's dishes, she learned to make choreg, the sweet smell of the mahlab filling the entire house every time the occasion came around. "The whole kitchen table would be wiped down and it would be 'choreg making time,'" Tascian said. "Even for people who didn't believe in God, choreg was the link to the community and the Spring." "From the outside, Lucy Boyajian's South Burlington home resembles every other bungalow on the street. Inside the aroma suggests the spice markets of Mesopotamia, the "cradle of civilization" between the Tigris and Euphrates Rivers." "Some call choereg the single most perfect tasting food," Boyajian says, later following up to say that Armenians honor guests by the amount of food we serve. "If 10 are coming, we cook for 100." I remembered this as I spent the days before Easter participating in the age old tradition of making choreg, too. Our assembled group reflected an Armenian kaleidoscope, hailing from Sivas, Adana, Van, Tabriz, Larnaca, London, Los Angeles and Detroit - we were from everywhere and nowhere at the same time, connected in this moment by this dough. We followed instructions from "Treasured Armenian Recipes," that iconic bound 1949 cookbook published by the Detroit Women's Chapter of the Armenian General Benevolent Union found in Armenian-American homes across the country. For so many families, choreg has been the link that has connected them to their Armenian-ness, to who they feel they are. When circumstances beyond their control have caused the disintegration of families, lineage and identity, food has remained the last cultural remnant of historically oppressed people who have lost so much. They may have forgotten everything else, but choreg never dies. Sift flour and put in a large bowl. Make a hole in the center. Dissolve yeast combine each package of dry yeast with a 1/2 cup warm water in a measuring cup, add 1 tsp. sugar and whisk to combine. Cover the top with a plastic wrap. Wait 10 minutes until the yeast starts to get foamy, which is how you’ll know it’s active (and not dead) and ready to be used. Melt the butter, beat the eggs and pour all of this into the hole in the flour. Add the rest of the ingredients. Blend the flour with liquid gradually, first with spoon, then with your hands. Knead the dough for about 1/2 hour or until your hands stay free of dough. Cover the dough well and let stand for 4 to 5 hours to rise (or overnight). Then, divide into 4 balls. Cut each ball into 3 slices, roll each slice with the palm of your hands, and braid the 3 rolls together. 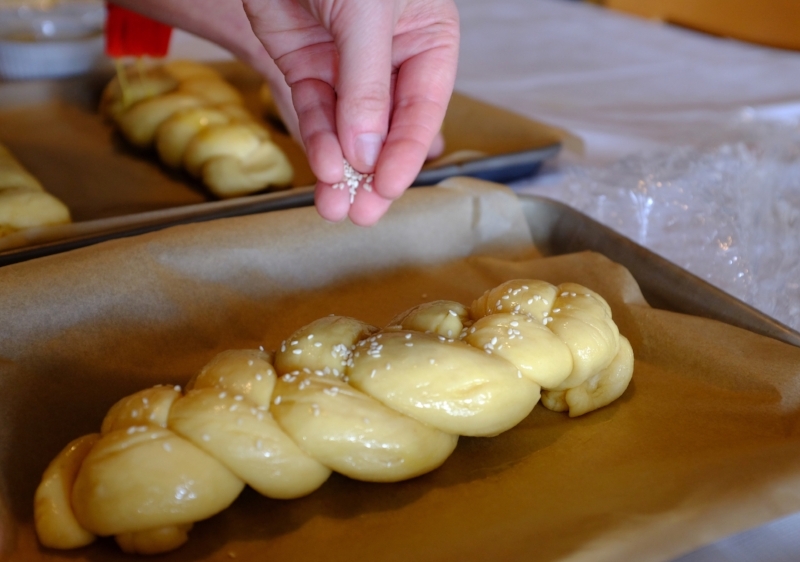 Let the braids stand for a while on the greased baking sheet until they rise some more. Then brush them with egg yoke. Sprinkle sesame seeds on top. Bake 20 minutes in a 400 degree oven, until golden brown.